L. paramictus specimen, Berlin Museum. Physical description: About 12 to 16 mm in length. Blackish brown dorsal side with dark membrane. Head is black with distinguishing red sides. 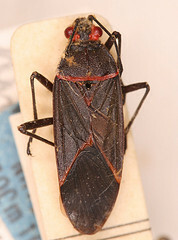 Scutellum forms a long triangle and is brown or red with a yellow tip. Ventral side is yellow. Appendages are brownish black. Leptocoris paramictus has been found in Mozambique but the exact location of where it was collected are not known.